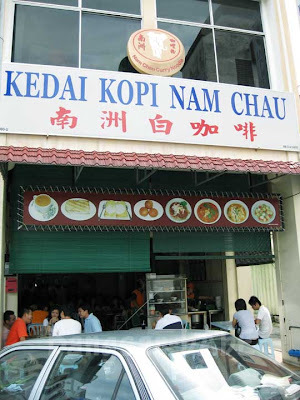 Apart from dim sum, Ipoh Hor Fun and steamed chicken, one has to try the dry curry mee in Ipoh. One of the most popular places to go to for a good bowl of curry goodness is Nam Chau, Ipoh Old Town. 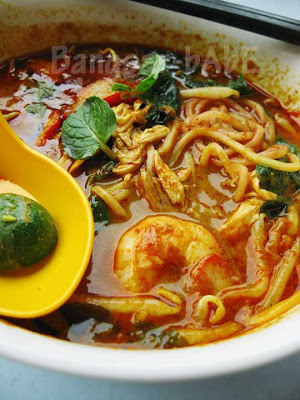 A bowl of curry mee is priced at RM3.60 and the noodles (choice of mee hoon, mee or hor fun) come with shredded chicken, char siew and prawns. I ordered the curry mee soup while the others had the dry curry meehoon and mee. The noodles were delicious! Well flavoured with spices, the delectable soup was enhanced by the coconut milk, which added body to it. The dry curry mee was even tastier. Topped with thick, luscious and fragrant curry paste, every spoonful made you crave for more. It was so good that I could not resist ordering a plate for myself! The roast pork was a disappointment, though. The skin was hard and chewy and the layer of fat was gelatinous. I liked the white coffee at Nam Chau better than that at Nam Heong. It was more aromatic (slightly smokey) and kau compared to Nam Heong’s. 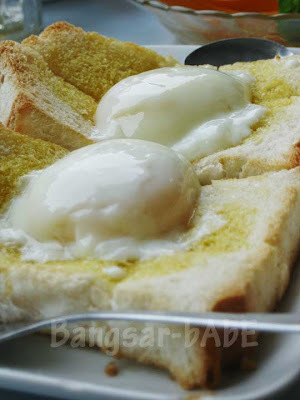 We spied a table ordering “dan chi”, or half-boiled eggs on toast (RM2.60), so we followed suit. The toasted bread came with two runny eggs on top. A dash of soy sauce and pepper was all it needed, and we were satisfied and happy. Verdict: The dry curry noodles is a must-try! jz lookin at the gravy tells me this curry mee rocks! hhmm..whr in KL got somethin alike tis? I am very hungry now. How? Look so delicious and tempting lol but to far lah. Just by looking at the curry broth, sure it is a good curry mee!!! mimi – The broth does look nice and red hor? SimpleGirl – I don’t know whether it’s the best, haven’t tried the others. But it’s yummy!! Nice post. Haven’t been to Nam Chau. Nam Heong’s coffee is not that smooth compare to Sin Yoong Loong. You are eating better than the Ipohan in me. 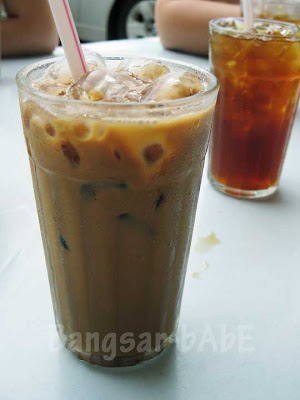 ooohhh… one of my fav in Ipoh. Yeah, Nam Chau’s curry noodles are pretty good stuff but I still love the ultra sinful one at the police station (all that kar liu and garlicky sambal at the side) and the super thick curry noodles at Yee Fatt. J2Kfm – Lucky lucky you!! the simplest is the best! (last photo) too bad about the siew yoke .. 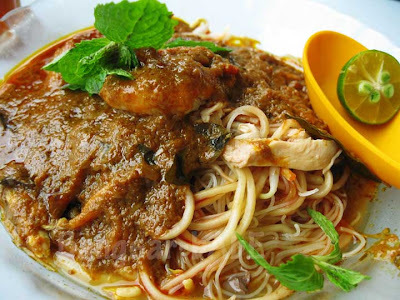 The dried curry mee looks good, does it taste like Sarawak laksa ? i prefer the dry version-not too spicy. NyonyaChef – Nope…different from the Sarawak version. I think Sarawak laksa has a tangier taste. Cumi & Ciki – Yup…I could eat this every morning! I’m not sure if it’s good or bad that blogs lack audio feedback. If I could post audio comments, this entry in particular would elicit howls of envy. Seriously, these food photos are killing me. Even the dan chi, as simple as it is, looks great. But the curry mee is what really got me. Delicious looking! Sapuche – Wow, howls of envy eh? =P The dan chi, as simple as it is, was the perfect finish to the curry lunch!